Stop and Smell the Honeysuckle! The Smokies is the place for wildflower hikes. The best way to see all the wildflowers that bloom in the Smoky Mountains is to take a hike. That way you can stop and smell the flowers. Just don't pick them. It's illegal! The Great Smoky Mountains National Park has more flowering plants than any other national park and over 800 miles of trails. So, the opportunities for seeing wildflowers is abundant! Wildflowers bloom most of the year, but the best time to see them is spring- April and early May. The second best time for wildflower hikes is early summer. While you can see wildflowers on any hike in the Smokies, the following trails offer some of the best chances to see them. Chestnut Top is a Top Pick for Wildflowers! If you're looking for wildflowers, then Chestnut Top is for you! You'll also get some nice views too. 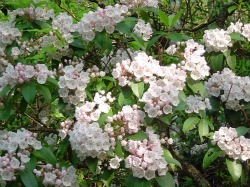 When I hiked this trail in early May, it looked like a mountain laurel explosion. I was also lucky to see some flame azalea. When you hike this trail, you can start from two different sides. One option is to start it at the intersection of Little River Road and the Townsend entrance to the Smokies. The other option is to hike Schoolhouse Gap Trail to Chestnut Top. Unless you have all day to hike 12.8 miles, you'll want to skip starting with Schoolhouse Gap. I've done option #2 and it was a nice hike. Another neat feature along Chestnut Top is a tree that is hollowed out, so much that you could stand in it (if you're not real tall:). Sorry I don't have a picture of it to show you. My camera wasn't working at the moment. 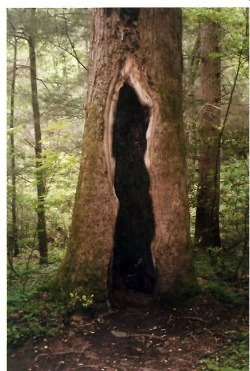 However, here's a pic of of a similar tree I found on a different trail. Approximate Elevation: Starts at 1200' at Townsend Rd. Trail ascends to 2400' at Chestnut Top then descends to 2100' at Schoolhouse Gap junction. How to get to the trail: From the Townsend, TN entrance, trailhead is located on the right, before you get to the intersection of Laurel Creek Rd. Check out the following links for more wildflower hikes in the Great Smoky Mountains National Park. Gregory Ridge to Gregory Bald, Wildflowers All the Way! Schoolhouse Gap-A Great Family Hike with Wildflowers Too! Smokemont Loop- Lots of Spring Wildflowers to See!